Form Description: Football is a great game, regardless of the skill level you are coaching. However, if you are going to be coaching, then you will need to keep track of a few important bits of data, such as the offensive statistics for each game that you play. 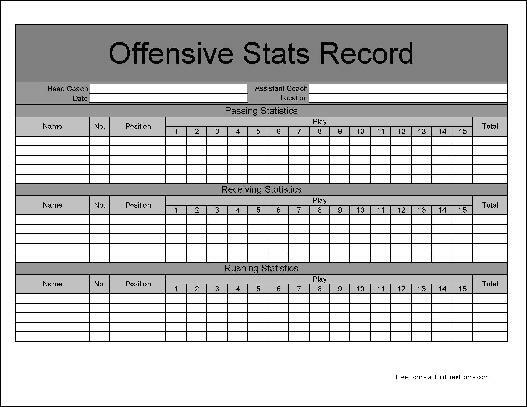 This Football Offensive Statistics Form can help you do exactly that. This form will allow you to keep track of all the relevant passing, rushing, receiving and so on that take place during the game. Definitely a huge help for any busy coach. This form ("Basic Football Offensive Statistics Form") is associated with the following keywords: football, offensive, little league, youth, team, statistics, data, tracking, contact, information, basic.